Registration is now open for Annual Conference 2019! To register for the event, click the button below. Under New Management! Newly Renovated and Remodeled Guest Rooms, Refrigerator & Microwave in all Rooms, Complimentary Breakfast available 6 am to 9 am, New Restaurant and Lounge, Shuttle Service to Popular attractions within City Limits, Complimentary Wi-Fi. Newly Remodeled, Complimentary Full Breakfast, Wireless Internet, Indoor Heated Pool, New Texas Roadhouse Grill on site. Complimentary Hot Breakfast, Fitness Center, Outdoor Pool, Wi‐Fi, Dish Network, Walking Distance to Restaurants, Recently Remodeled, Pets Welcome. Current nominations can be found here. For instructions on submitting nomination forms (which can be done up until Annual Conference 2019 itself), see below. At Annual Conference 2019, we will have a mobile app available with all of the information you’ll need for the event! Check back soon for more information. The 2019 Arkansas Annual Conference Pre-Conference Journal is now available online. To view or download the journal PDF, click the link below. Vendor registration is now full. Thank you for your interest. Barnabas Award – please email your nomination to Reverend J.J. Whitney at whitney@hendrix.edu no later than May 15, 2019. Please include the name of the person you wish to nominate and an explanation telling why you feel this person should receive the 2019 Barnabas Award. Eternal God, As we gather for this sacred conference, we do so as Christ’s disciples. May our words speak, our actions bear witness, and our thoughts ever remain on the most important Truth of all: You are with us. Father, Son, and Holy Spirit, redeems and empower us to carry out your mission in the world. In Christ’s name. Amen. We are able to offer childcare at First United Methodist Church of Hot Springs for those who register. When you click on the link you will see all the day and evening childcare options for your child. You must register your child for care by May 20, 2019 so that we are able to plan for space and staffing. We will be unable to take reservations for childcare after May 20, 2019. If you miss the deadline we cannot accommodate drop-in care due to staffing and space. In order, for us to be good stewards of time and money we ask that cancellations for care must be made by May 20, 2019 as well. You will get an email on May 21, 2019 telling you what you will need to bring for your child while they are in care of FUMC Hot Springs. Children three and under will be asked to bring their own pack and play for nap time. Tanako has graciously offered to cover the elementary age childcare for the four days of Annual Conference. Please use the coupon code ARUMC19 so that the conference will be charged for your child’s attendance. May 20, 2019 is the cut-off date for registering your child for Tanako. If you miss this deadline, you will need to make other arrangements on your own for childcare during the conference. Annual Conference will pay your child’s fee for Tanako for the four days only if you have registered your child by the May 20 deadline. Cancellations must also be done by May 20, 2019, due to the need to acquire appropriate number of camp staffers. Please note if you have more than one child in this age group you will need to go in and separately register each child into the Tanako website. 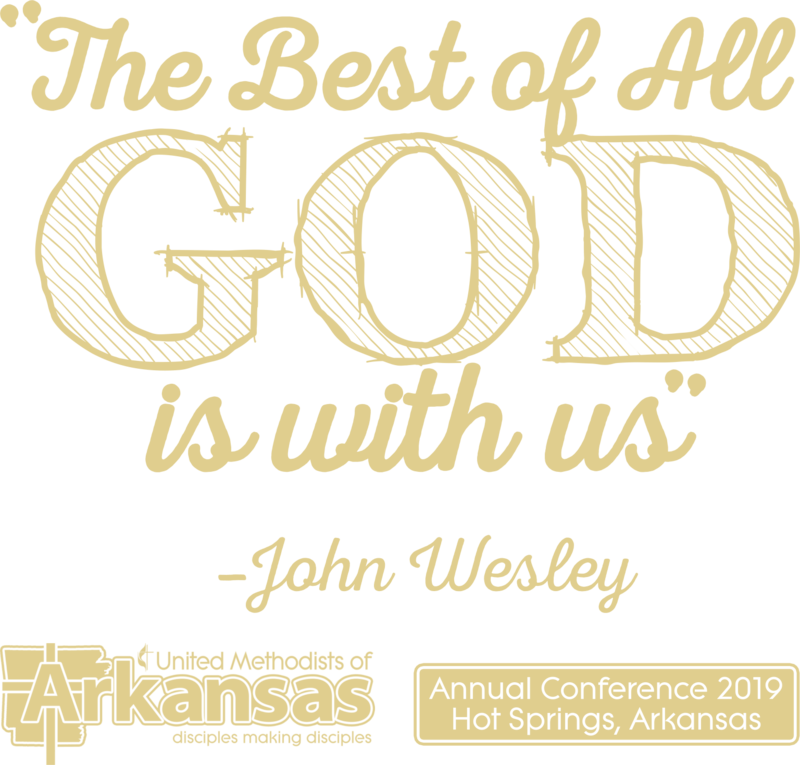 We are able to offer evening care at First United Methodist Church. Your child must have eaten dinner before dropping off for evening care. Care will be offered for Elementary age students from 6:30pm to 9:00pm on Wednesday, May 29 for meetings and Friday, May 31 for the Ordination Service. Please have your child/ren registered by May 20, 2019. The deadline is firm in order to allow us time to find enough childcare providers for the number of students who register by the May 20 deadline. Cancellations are also due on May 20, 2019 due to the need to acquire the appropriate number of childcare staffing.